Hello everyone and welcome to the Your Next Stamp (YNS) January blog hop! The hop begins on Carole’s blog and if you have been hopping along, you should have come from Tracy’s blog. Make sure you hop around to all of the blogs featured in the link list at the bottom of this post. 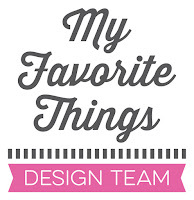 You will find lots of inspiration using these new products! To celebrate this new release, I did a project with the *NEW* Perfect Chemistry clear stamp set. Click HERE to see another card with the fun scientist I made for the preview day! I colored the mad professor (he is SOOOO fun) with Copic markers and fussy cut him. I sponged Distress inks (Picked Raspberry and Barn Door) onto a white panel using blending tools and splattered some water here and there. Lastly, I added sequins and little hearts using a stencil with embossing paste and Stickles on the top. The sentiment "Mad about you!" 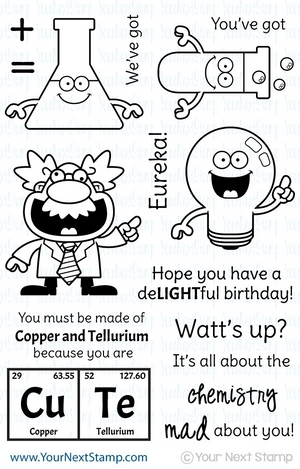 is also from the Perfect Chemistry stamp set. A random winner will receive $20 to spend in the YNS Store. If you leave a comment on all of the blogs, you could win this $20 gift certificate! Karen will post the winner on the YNS blog on January 10th. Use the special online code to get 20% off your entire purchase!!! Now it's time for you to head over to Laura’s blog but don’t forget to leave a comment before you go for your chance to WIN the $20 gift certificate! So super cute, I love it!!! Diesen schnuckeligen verrückten Professor muss man einfach mögen, vor allem wenn er so schön in Szene gesetzt wird wie auf Deiner Karte! That is just the CUTEST stamp set. Oh my.................. and how you sponged behind the image is brilliant Francine. He's so cute, love the bold color. Brilliantly done! Love the background on this. It really sets the scientist image off well! WOW! Love the bright colors and the beautiful layout! That is adorable!!! Your coloring is gorgeous and that hot pink background just really sets off that cutie to perfection. Your card SCREAMS fun!! I love how you did your background and the chemist and the sentiment!! This is super duper fantastic!! Really cute card. I like how he's coming out of that haze of red. Really effective! OMG this is really awesome I am in love the stamp, the coloring the layout. TFS. Amazing coloring! Love the inked background! Simply adorable, love the image coloring against the background. You can see the heat pouring off this card. Love it. Oh Francine, your card is so cute! I really love the little professor. Your coloring is stunning! I Just LOVE that Professor . He just cracks me up ! GREAT Job!!!!! Fabulous. Love the water colored background and your coloring on the scientist. Cute new stamps! Your card is adorable! Love how you made the background! So cute - love the image. The chemist just pops off the card with that brilliant background. I love the addition of the tiny hearts. I like the background for your mad scientist. Love the background, very creative! You made a stunning background - love that crazy professor! Oh my gosh, I LOVE your mad scientist and the background is gorgeous... just what was needed for love, and for that stereotypical white coat to show! This is totally the stamp set I'm getting if I win!!! Oh too cute! Loving this set! So cute! Love how you colored your card! Thanks for sharing! Francine, that background is simply amazing!!! I LOVE the background on this card! 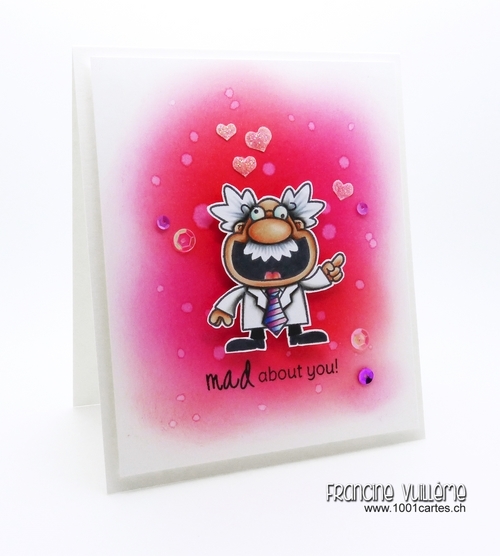 Fun card...that scientist makes me smile! Your card is gorgeous, Francine, as always. :-D I like this one a lot! So cute, love the background the stamp set is so fun. TFS. Awesomely well done card - so impressed with your stamping and coloring!!! Excellent Job!!! That background is so unique. It really makes everything pop. I Love it! So many great cards with this stamp set! !